A scribbled note changed my life. When I was 13 years old, my older brother conned me into spending the day helping his friend move. At one point, myself and one of the other guys who'd shown up took a break from shoving furniture through the door. He told me he was a skydiver -- that he jumped out of a plane almost every weekend. He scratched down the phone number of the nearest dropzone for me as I gaped in thunderstruck silence. He laughed, and told me I had to wait until I was 18 before I could jump. I kept that torn-off piece of Thai takeout menu in my wallet for five years. To celebrate my 18th birthday, I jumped out of a plane three times. The rest, as they say, is history. To date, I've jumped from helicopters, hot air balloons, cliffs, office buildings, hotels, bridges, radio towers (including a few I was doing maintenance on, during a short stint as a cellphone tower technician), tandem paragliders, high-tension power pylons and more than a dozen types of aircraft. It wouldn't be a stretch to say I'm obsessed with expanding the collection of objects I've ejected myself from. A year after my first skydive, I made my first BASE jump -- in front of 250,000 people. That jump, at Bridge Day in West Virginia (one of the only legal BASE jumping events in America), was the first of more than 400-and-counting BASE jumps I've enjoyed to date. The same year I did my first BASE jump, I made my first wingsuit skydive from a rear-exit aircraft at the World Freefall Convention. 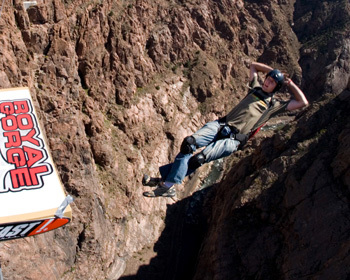 It wasn't long before I did my first wingsuit BASE jump from a cliff at a tributary of the Grand Canyon in Arizona. Paragliding and speed flying came later -- in 2006 and 2008, respectively -- and I'm still stretching the limits of what I can do in the air. As much as I enjoy hurtling around above the earth's surface, I also love spending time underwater. I earned my basic PADI Open Water SCUBA rating in 2007, moving on to advanced open water certification in 2008. I've scuba dived extensively in the US and Mexico, traveling to Belize to swim with schools of hammerheads in the Great Blue Hole -- and to South Africa, to hang out with Great Whites. In the course of accruing over a thousand skydives, 500+ wingsuit jumps and 400+ BASE jumps, I've traveled all over the globe. I've lived, flown, scuba dived, and jumped my way across Mexico, Belize, Zambia, Namibia, South Africa, Zimbabwe, Botswana, Peru, New Zealand, Turkey, Croatia, Greece, Italy, Switzerland, and France. As well as exploring the seas and skies of all these different places, I climb all over them (I've been rock climbing since age 8), slide down them (I've been skiing just as long) and backpack into the middle of their respective nowheres. My life was changed forever by that scrap of paper that was handed to me nearly fifteen years ago. I'm incredibly grateful for the life it inspired. My life's work is to ignite others in the same way: to share the encouragement inherent in the fact that life is a grand experiment, that the world is everyone's to explore and that yes -- it is possible to fly.